Problems synchronising your Nexus 5 via ActiveSync? 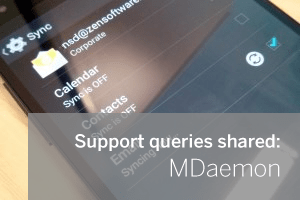 A couple of us in the office have just taken delivery of some shiny new Nexus 5’s – fantastic devices we’re really happy with but we’ve unfortunately both come across what looks to be a known issue setting up the ActiveSync connection to synchronise them with MDaemon Messaging Server. MDaemon has an integrated ActiveSync server but this issue with the devices will also apply to those of you who use Microsoft Exchange. When you add an ActiveSync account you’ll find the initial synchronisation works as you would expect. However, after this first successful sync, the account can no longer send or receive any data rendering this part of it completely useless for sending or receiving email or doing anything with your calendars and contacts. Upon closer inspection of the account settings it appears to be constantly attempting to synchronise. This process keeps the email application running which, as you can imagine, hits the battery life pretty hard. Unfortunately re-creating the account doesn’t seem to help, neither does changing the setting from Push to sync every X minutes. Unfortunately, until Google find a fix for this issue the only work around is to not use ActiveSync and instead switch to a standard IMAP connection. ( please note if you don’t already have IMAP access open on your MDaemon server you will need to do this first). We’re hoping this issue’s resolved pretty soon and we’ll update this article as and when it happens. (Update: 13th Nov) The latest news is that Google is about to release Android 4.4 Kitkat for the Nexus 7 and 10 devices today but early indications would suggest that there are no fixes added for the ActiveSync issue we have seen on the Nexus 5. For this reason until this is proven to be working we recommend that you don’t upgrade if you are using these devices with an ActiveSync account.